Vertaald door Feel Hostels Soho Malaga is in een uitstekende, centrale ligging in de buurt van de haven. Het is om de hoek van CAC Málaga, op vijf minuten van het Parque de Malaga en op slechts 10 minuten lopen van het Alcazaba. 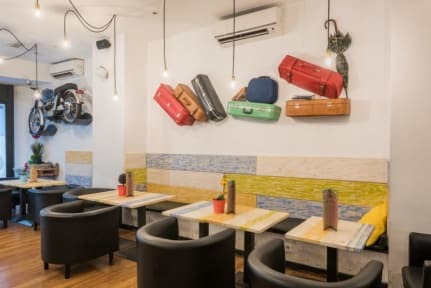 Hostelworld gasten geven consequent goede ratings naar dit hostel, zeggen dat het een 'fantastische locatie, geweldig vriendelijk personeel en echt waar voor je geld'. Het vriendelijke personeel gezet op vrije paella nachten die geweldig om te voldoen aan uw medereizigers zijn. It is a good place. The only negative point is, that it is at a street full of trafic. At night this makes a lot of noise, so you have to close the window and sleep in a bad air, because of the other sleeping people on the dorm all together. We have had a really nice stay! The beds were nice and the bathroom was clean. Before we went on a night out we had some drinks at the bar / front desk, and it was great. Nice, helpful staff from our age which makes the atmosphere very good. Cool hostel! Very helpfull staff especially Pedro 👍🏻 I will definitely stay here again when I’m in Malaga. 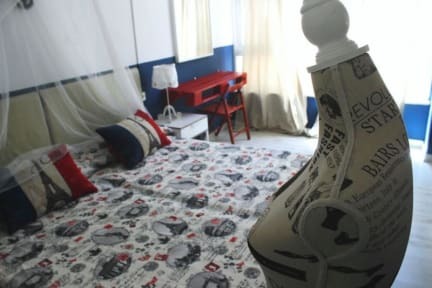 Very nice and clean hostel! Breakfast was good and cheap. Thanks a lot for a lovely stay! Great hostel!! Clean rooms, good location and very kind and helpful people. I recommend this place to everyone. Really nice location, clean and friendly staff! Nice common area, but we were there in november so it was not really buzy with people. Prima hostel, wel erg gehorig en jammer dat er 1 badkamer is voor 10 personen (zonder aparte wasbak of wc). The 4 bed dorm were I stayed was really really hot . And the beds very wobbly. When I checked in put mine stuff in the locker below the beds and rested for a while on the Boden bed then I noticed already it was very warm in the room . When I came back later somebody took mine bed and I could understand why the only other free bed was really directly under the air condition wich however only blew hot air . This one is really 30 cm from your bed . Couldn’t sleep for one second the whole night.